Being a child of deaf adults often means being the eyes and voice for your parents. For my siblings and me, interpreting for our deaf parents was normal, when at a restaurant, out grocery shopping or other occasions with a hearing person. The few moments we did not have to interpret were when we were watching a movie or TV together as a family. Our TV provided closed captioning, so my parents were able to follow along by reading the subtitles, and we all could enjoy the movie together. Like millions of other people who are deaf, hard-of-hearing or have auditory sensory disabilities, my parents also rely on their computers for information and communication. They were excited to discover closed captioning was available in Windows 10, and started using it when they watched movies on the Windows Movies & TV app. Closed captioning is one of several essential features available in Windows 10 for people with hearing difficulties. Other features include ways to make alerts and notifications more visible, and accommodations for partial hearing. Let’s look at some of these features — you or someone you know might find one or more helpful. While many sites that publish videos include closed captioning (CC) as an option with their videos, the CC settings usually come preset, with little chance to make the captions easier to read or see. Windows 10 apps such as Movies & TV enable CC, but the default appearance doesn’t work for everyone—my mother found it hard to see the CC in an action movie we recently rented in Movies & TV. 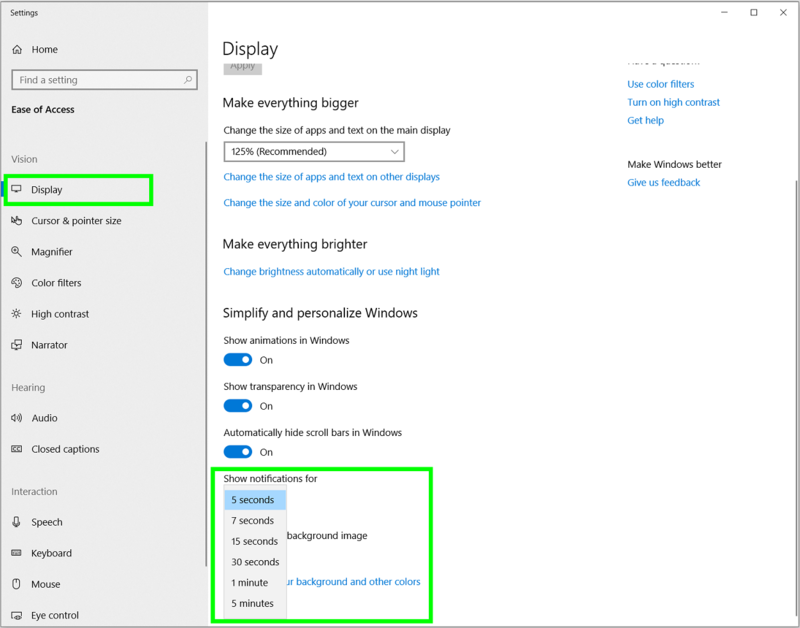 But in Windows 10, you can set the size, color and font of CC that appears in Windows apps, and in some websites you view with Microsoft Edge. This not only can help those with hearing difficulties watch videos more comfortably, it also can be helpful for people who are blind or who have low vision as well. 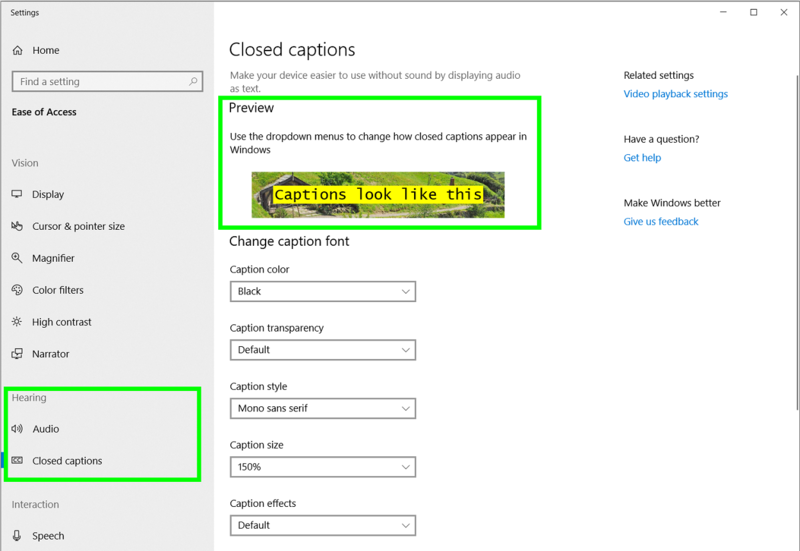 You can change how captions appear in Windows 10 by going to Settings > Ease of Access. 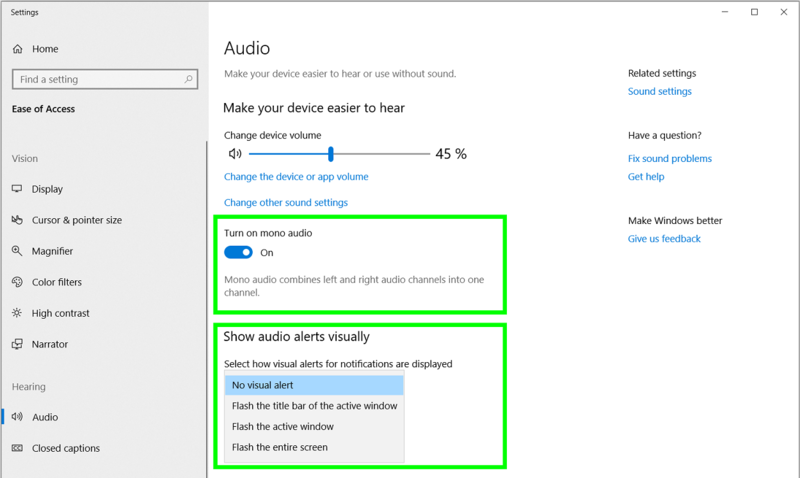 An even easier way to find these settings is to type “hearing” into the search box on your taskbar, and then select Ease of Access hearing settings. Under Hearing, on the Closed captions tab, there are many ways to make closed captions appear just how you want them. Under Change caption font, you can change the color, transparency, style, size, and effects of the actual words in your captions. Under Change caption background, you can put a color behind the captions for better contrast and visibility. Check Preview at the top of the screen to see if you like your new settings. Reminder: These settings might not apply to some videos you watch online, like on YouTube or some online news sites. Many PC functions include alerts to tell you about things you might want or need to know, like when an email or notification arrives, a sign-in attempt fails, or there’s an error. The alerts often come with an audio signal, such as a beep or chime, but you can set Windows 10 to replace that with a visual notification. This means a brief flash of brightness, which can light up your title bar, the active window you’re working in, or your entire screen. You can set this up on the same Ease of Access screen, under Hearing, on the Audio tab. Use the drop-down menu under Show audio alerts visually to select how you’d like audio alerts displayed. If you have trouble hearing sound in stereo, it might help to set Windows to convert all stereo sound to mono. Go to Settings > Ease of Access > Audio, then switch on the toggle under Turn on mono audio. Notifications are set by default to disappear after five seconds. But if you don’t hear the audio alert, you might miss it. To make sure you have time to read any important notifications, just set them to stay on your screen a little longer. Go to Settings > Ease of Access > Display, and under Simplify and personalize Windows, choose an appropriate amount of time using the drop-down menu under Show notifications for. If you have an idea or suggestion for another setting or Windows capability that would help you, please tell us with the Feedback Hub: just enter “feedback” into the taskbar search box, or press Windows logo key + F. Your feedback goes directly to Windows engineers, who could make it part of the next Windows update. Until then, I hope you find something among these features that helps you have the best possible experience on your device!